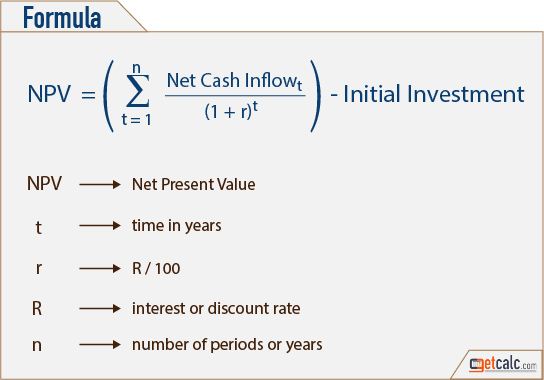 getcalc.com's Net Present Value (NPV) Calculator is an online finance tool to calculate if the project is profitable by calculating present value of investment by applying continuous discounted rate on net cash inflow (difference between present value of cash inflow and outflow) received from the project over a period of time. Net Present Value is a finance function or method used in the context of time value of money calculation, often abbreviated as NPV, represents if the project is profitable by calculating present value of investment by applying continuous discounted rate on net cash inflow (difference between present value of cash inflow and outflow) received from the project over a period of time in the finance industry. It’s a measurement of projected profitability of the business where the positive and negative NPV represents projected profit and loss of the business respectively.